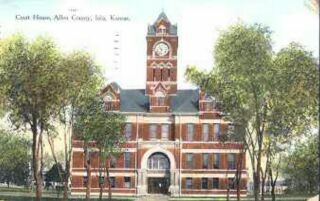 This site is for genealogists and historians interested in Allen County Kansas, research resources and links. If you have questions or comments feel free to contact me, Lonna Nevil at: kscoallen@usgennet.org. Many thanks to Bill and Diana Sowers for their instrumental work in setting up this site. Without their dedication much of what is on this site would not be here. With the help of those genealogists and historians who are interested in Allen County Kansas I hope to make this genealogical and historical site something we all can be proud of. Please add your Allen County family to this page. This nonprofit research network is an independent affiliate of the American Local History Network, Inc. (ALHN) and hosted at no charge by USGenNet, a nonprofit web-hosting service solely supported by tax-deductible contributions. If this website has provided you with useful information, please consider making a donation to USGenNet to help keep sites like this online. No claim is made to the copyrights of individual submitters, and this site complies fully with U.S.GenNet's Nonprofit Conditions of Use.